September 27, 2016, 11:15 a.m.
2016 has been a great year for professional British swimming. With six Olympic swimming medals in Rio including a fantastic Gold from 100m breaststroker Adam Peaty, Team GB doubled the size of their haul compared to London 2012. With great swimming success in the Paralympics as well, namely from athletes such as Ellie Simmonds and Bethany Firth, YouGov conducted a poll to see if our success in the Rio pool mirrored public ability back home. Nearly nine in ten British people (88%) say that they can swim, with 61% rating themselves as ‘reasonable’, ‘good’ or ‘very good’ swimmers. Swimming ability declines with age - 70% of 18-24 year olds say they are reasonable swimmers or better, compared to just 44% of people aged 65 or older. In fact, one in five (20%) of the 65+ age group said that they could not swim at all, making their age group the most inept in the water. Of the 11% of people who say they cannot swim, almost six in ten of these said that they would like to be able to swim, compared to a third who are uninterested. The genders are divided on their attitudes here: male non-swimmers were much less concerned than female counterparts about their inability to swim. Similarly, male non-swimmers are much less likely to have tried to learn to swim than female non-swimmers. It is a national curriculum requirement that all primary school children be able to swim 25m (the length of most public swimming pools) unaided. 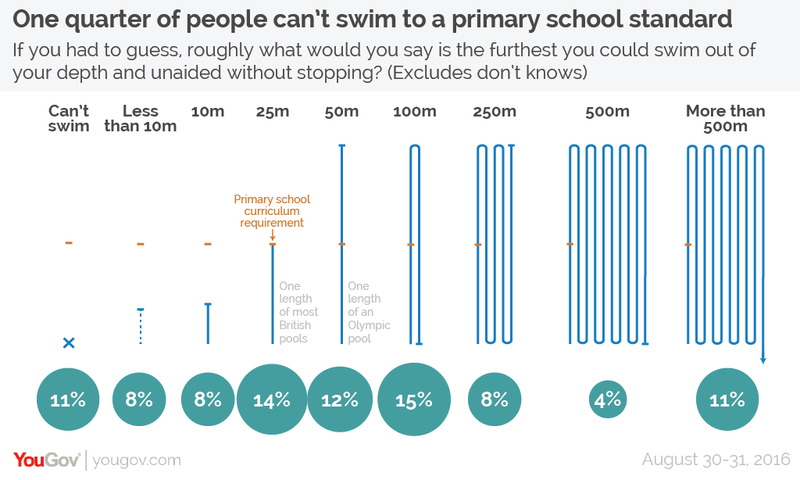 Three quarters (74%) of respondents who said they could swim believed they would be able to meet this 25m requirement, with 58% saying they could beat it and go 50m or more. Working class people are less confident in their ability to meet the 25m target, with 33% saying they either couldn’t swim 25m or didn’t know if they could, compared to just 20% of middle class people. Whilst the introduction of the national curriculum swimming requirement is a welcome one, the tragic sea deaths on the UK’s coasts this summer show that there is still more to do to reach those who didn’t benefit from swimming lessons in their own youth, or whose swimming confidence is low.